While thrifting a few weeks ago, I came upon something very exciting: a giant collection of old tapestry yarn. You know -- those little 15-yard bunches of colour-fast, moth-proof 100% wool. (I don't even know what it's meant for. Needlepoint?) If it had been a proper thrift shop, the whole pile would've been in a garbage bag for five bucks, but it was V@lue Vill@ge, so the huge amount of wool had been separated into a hundred separate little overpriced bags. I spent about fifteen dollars on five different colours. I knew I wanted to crochet another blanket, this time with a vintage (1940s-ish) palette. Lots of bloggers have been crocheting granny squares, but I didn't want to use my 1930s/1940s colours in squares that make me think of the 1970s. 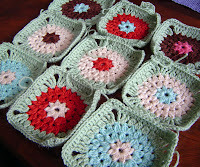 I looked online at various afghan squares and settled on a pattern called Cluster Flower Square. 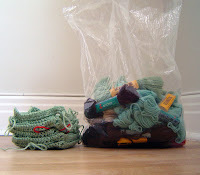 I was very excited to find fifteen little skeins in the perfect shade of Depression-era jadeite green, and I want that to be the main colour. So I crocheted a few squares, using the green as the border around the centre circle. I think if I also use the green to join all the squares, it'll look a bit like a green blanket with multicoloured polka dots. So far, I'm very excited about this. My first crocheted blanket -- which is this close to being done; it just needs a border -- was a great project for using up leftovers, and it's bright and colourful and cheerful, but I adore the colours of this vintage tapestry yarn. However, each crocheted square uses just over one little skein of green, and I only had fifteen. Only one thing to do: I went back to le boutique V.V. hoping there'd be more. 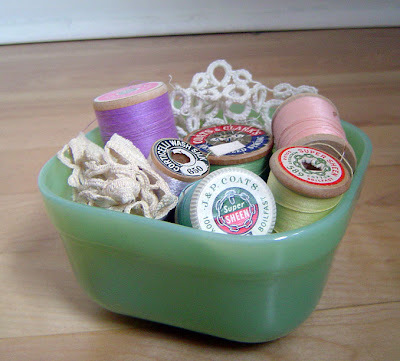 Yep, a little FireKing jadeite bowl ($1.99), which is filled here with the contents of another $1.99 bag: a dozen nice old wooden spools of cotton and silk thread, and two strips of antique crochet tatted trim. Oh, I love it when a thrift comes together. the color of the jadite is so pretty! a perfect spring green! It's already gorgeous. You are my hero. Love the bowl and wooden spools. I would have a ton of those spools if I had saved all of the ones I used. I think the lace in back may be tatting, without looking too close. ooh this is going to be a beauty! stop tempting me with the crocheted blankets! those little squares are so pretty. nice work. wow you're becoming quite the crocheter!!! impressive. I absolutely love "Bring it on" and that is one of my favorite quotes. Thanks for making me laugh out loud! The crochet squares are beautiful. I'm very impressed with your thrifting skills. Blanky is gorgeous! Wish I was better at using a crotch, as the first cool Autumn night have arrived. I think I actually needed my doona last night, but it was packed away, and I was too tired to get up so I just suffered...Boo hoo! hey! i've been reading your blog for about a month or two (ever since i started mine) and its really beginning to hit home. your entries i mean. 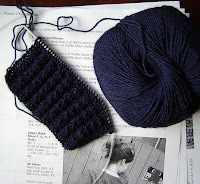 oh, the days that i could knit and read endlessly without worry or concern. but alas, they are gone (at least until summer) due to papers upon papers and hours upon hours of class work. i admire how you keep on knittin'! I let out an audible sigh when I saw that Fire King bowl. Someday I will photograph and blog my Fire King bowl with spout and what we around here call the "pretty plate." Loving the crochet. Someday, I, too will get around to picking up the hook. that blanket is going to be beautiful! Scuze me. Just wiping the drool off my keyboard. You are my VV hero - Fire King? Sweet. Yarn stash? even sweeter. Did you watch the Juno pre-show? One of the nominees said his outfit had been supplied by "Valooie Villahgie". Heh heh. FIREKING! AGHHHH!!!!!! I haven't seen my collection since we moved. Soon, my little jadeite lovies, soon! Waffle stitch got the best of you? What a fabulous, optimistic shade of green. Great thrift! Heehee. Were you chewing on a big ol' cigar when your thrift came together? My kids all have names that start with M (it just sorta happened..really..). Anyhow, if my husband had had his way my son Murphy would be named Murdoch and called Mad Dog. Such is the hubsters love for the A Team (and my oldest worships at the boot-clad feet of Mr T). Love the retro colors and the little Fire King bowl. You are a evil, tempting crocheted blanket genius, putting that bright red with that soft green. Perfect perfect perfect. Now I want one of my own. Your vintage finds are so terrific! And hooray for you on finding your crochet mojo. I so enjoy the way you pull these colours together! Wonderful! I love your squares, they're beautiful. Your blanket will be just gorgeous! Wow - the goddesses of thrifting were certainly smiling on you this week! Those squares are looking wonderful, love the vintage color scheme! I clicked over from a comment you left on another blog after seeing your name was Alison, spelled the same way mine is (only I've gone by ali for years...) Anyway, just thought I'd say 'hi'! Sweet! I love all of those colors together! Lucky gal. I agree, those blocks are much more suitable for that era. Just lovely.